Home > Featured > How I Controlled Blood Sugar Levels In A Month? I being 36 years of age never thought that I would be a diabetic. I had gradual weight loss since a year without any specific reason. Some of the close ones suggested me to take diabetes test, but I simply ignored. This weight loss continued and I was affected with Balanitis too. That too, it showed for second time in a year. During the first occurrence, which was a year back dermatologist said that keeping the foreskin unclean is the reason for this infection. From then, I was very hygienic regarding cleaning foreskin. But, it appeared again. When I googled about the causes for the infection, I found out that one of the main cause for Balanitis is diabetes. So, I went for diabetes test. I was shocked to see the diagnostic result. Diabetes was confirmed and I was with 216 in fasting blood sugar count and 336 in post food blood sugar count. After consulting a diabetologist, he suggested to go for Hemoglobin A1c test, which was also high. 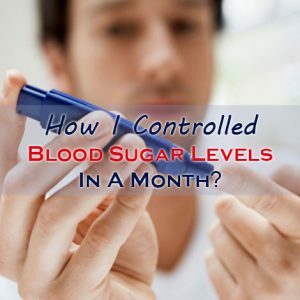 What I Did To Control Blood Sugar Level In A Month? After seeing my Diabetes diagnostic report, doctor suggested me few things to do, which I followed strictly and brought my blood sugar levels to normal levels. Let me share what were those suggestions. Diet is an important factor that plays vital role in controlling Diabetes. I being an Indian and that too from southern part of India accustomed to take rice for lunch and dinner. And few times I even used to eat rice in breakfast too. This was one of my main causes of diabetes. As for my doctor’s suggestion I started eating rice only in lunch. And for breakfast and dinner, I started eating roti with oil (normally known as pulkha). Apart from this he also suggested me about the foods I can eat freely, moderately, and completely avoid. He also suggested me to take a teaspoon of fenugreek powder before breakfast. I was also advised to eat less and more number of times. My diabetic diet starts with 2 pulkhas in the breakfast, after two hours of breakfast I take 2 biscuits and a small cup of green tea, and for lunch I eat rice with curry made out of foods that were suggested. During tea time, I take again 2 biscuits and a cup of green tea. And in dinner, I eat 3 pulkhas. I am allowed to eat small amount of chicken curry twice in a week. This is another important thing that helps in controlling blood sugar levels. Leading a sedentary lifestyle without much physical activity is another important cause of diabetes mellitus. Doctor suggested me to exercise at least for 45 minutes in a day. I am doing brisk walk for an hour every day. This one hour of brisk walking, I have spilted into 15 + 45 minutes. 15 minutes of brisk walking after a short break after lunch and another 45 minutes walking in the evening. In our present day lifestyle, almost everyone faces the problem of stress. Stress can result into many dangerous health conditions. One such condition is diabetes. Due to workload, I was getting stressed out a lot. During the first 15 days, I was prescribed to take medication twice in a day. After completion of 15 days course, as suggested by my doctor, I have undergone another diabetes test. Astonishing, my blood sugar levels decreased to 88 for fasting sugar test, and 115 for post breakfast sugar test. After seeing my test results, do you know what the doctor. “Are these your test results itself?”. I just smiled. Doctor prescribed me medications, which I had to take twice in a day. But, this time medications were of decrease dosage. This, it was a month course. And I was also told to take another diabetic test after completion of medicines. I same diabetic diet, regular exercise, and medications continued. But, this time unfortunately, I forgot to take medications that I take during night thrice and I have even attended party twice, where I ate fully. These things made me a bit nervous and I thought this my sugar test results will increase. After completion of medicines, I took glucose test. When my test results came, I saw the numbers with cross fingers. Noway, I was once again shocked to see the results. My blood sugar levels were totally under control. My fasting blood sugar levels were 79 and post breakfast blood of sugar levels were 97. Doctor after seeing my test results said me that I doing good and controlling sugar levels very well. This time he prescribed me to take one medicine once daily before breakfast. And gave these medications for 60 days and even told to take test after 60 days. So, I learned that proper diabetic diet, exercise, medications and staying away from stress will definitely helps in lowering blood sugar levels in just couple of months. Very useful article as numbers of people having diabetes are increasing rapidly. Our sedentary lifestyle makes it even more worse. Thanks for sharing this wonderful topic with us. I have also prepared a infographic about side effects of sugar. You can check this out on DishforDiet.